Hello to you all and greetings to March! but it is time to share my shamrock tea china! Please grab yourself a tea cup and join me! 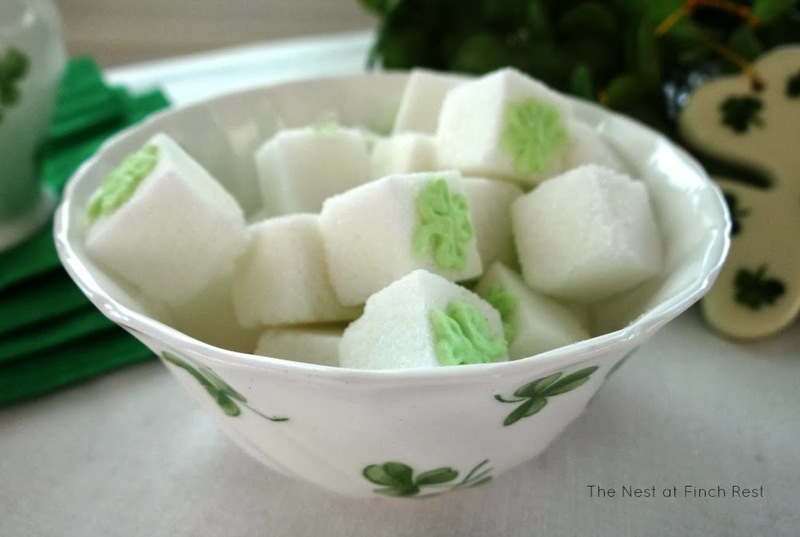 lump or two of shamrock sugar cubes! 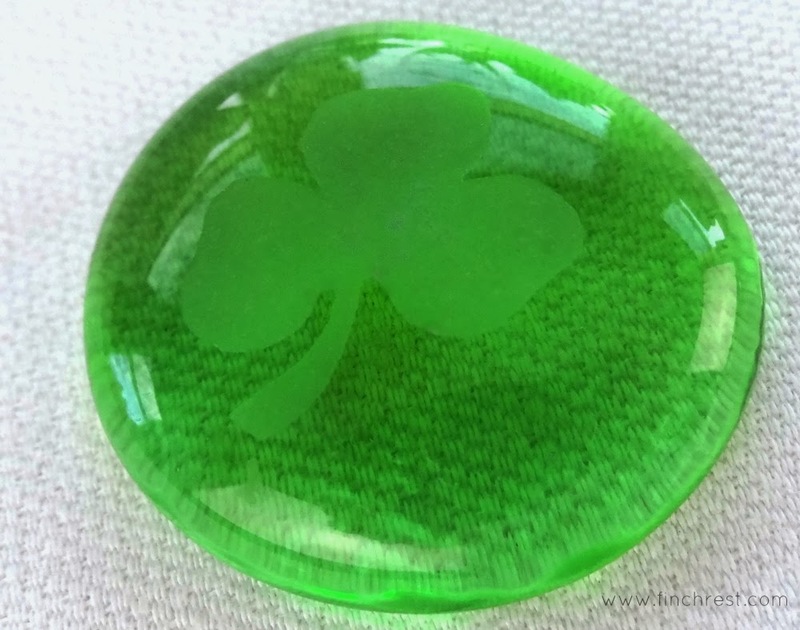 I have been collecting shamrock things for years. the just-right-size for pistachio moussse! a wonderfully sweet gift from my eldest daughter. She knew how I'd love a shamrock teacup! I have found quite a few different ones over the years! 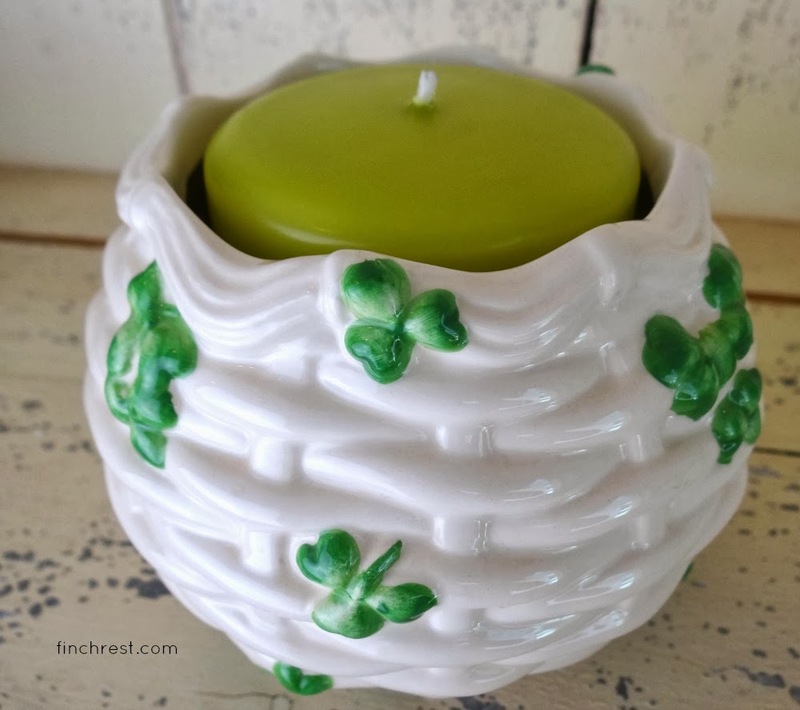 St. Patrick's Day Irish vignette! 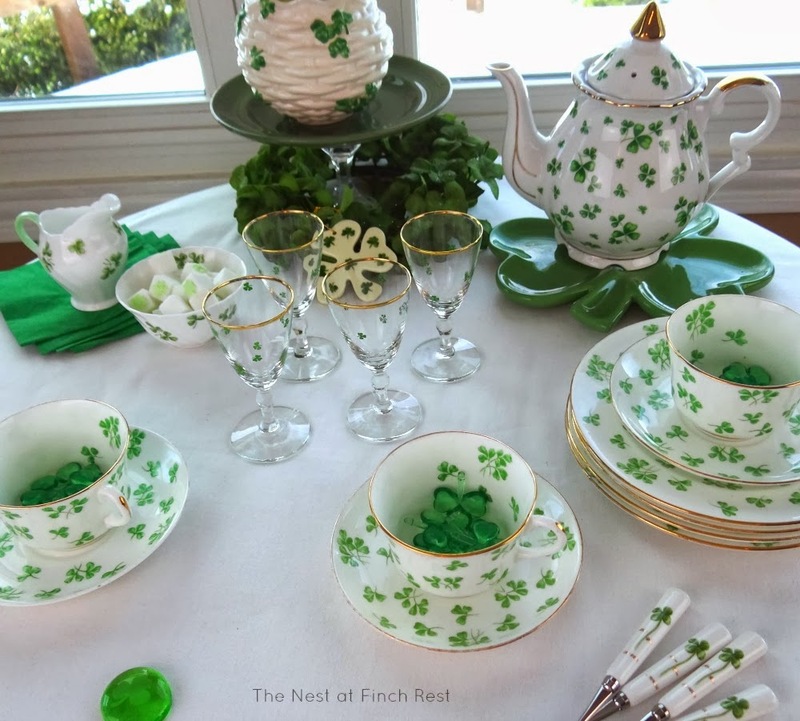 St. Patrick's Day crawl with all this shamrock china to share. I have shamrock stuff all over the house and even outside. Stunning china and setting Michelle! I'd love some tea pouring out of that gorgeous teapot! Thanks for sharing! Fabulous setting Michelle! What a great collection you have! Sp perfect for the occasion! I especially like the flatware handles and your sugar cubes. Too cute! Oh Michelle, I love your tablescape! 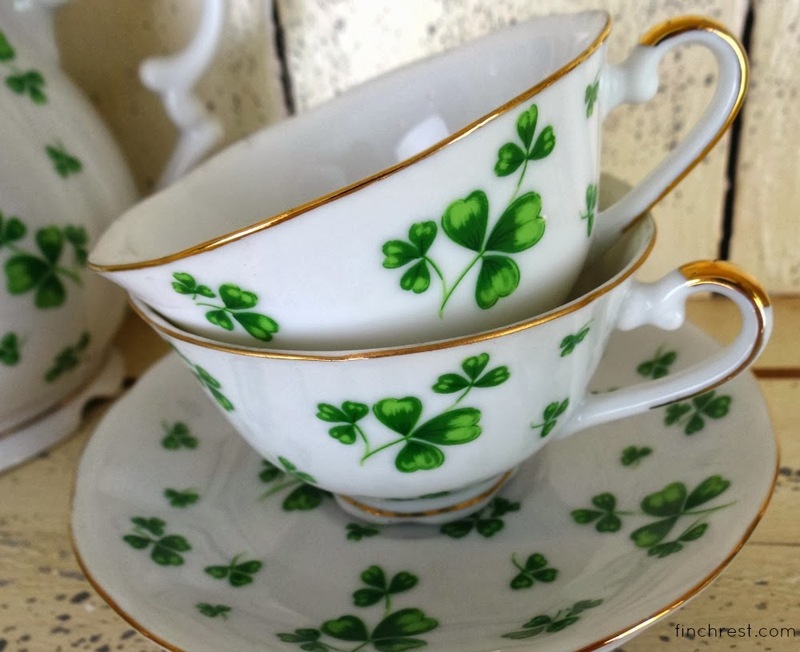 Your shamrock tea china set is just fabulous and just brilliant looking and your little great details are just precious! You stole my heart with all your beautiful Irish things. All so beautiful. 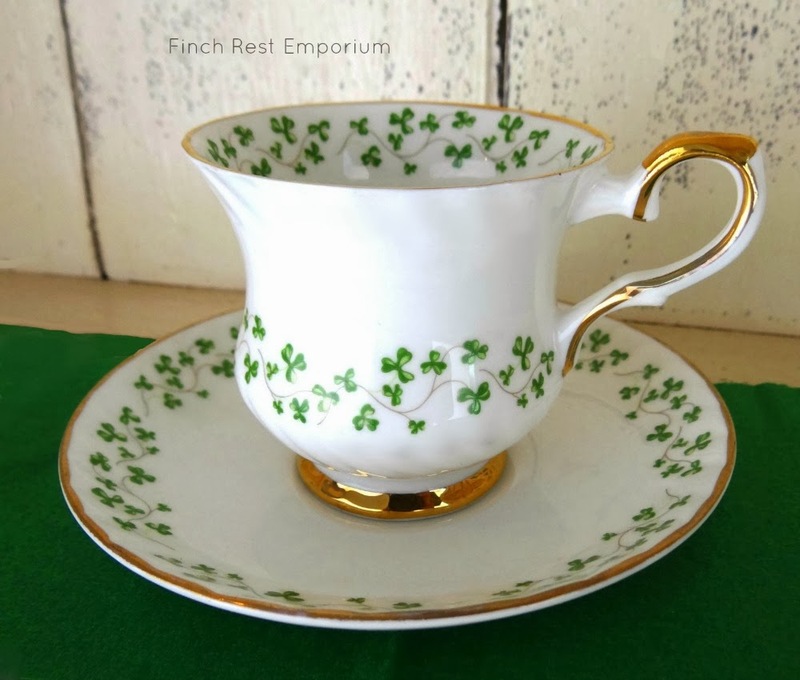 Glad to see you back and glad to see your beautiful shamrock china! 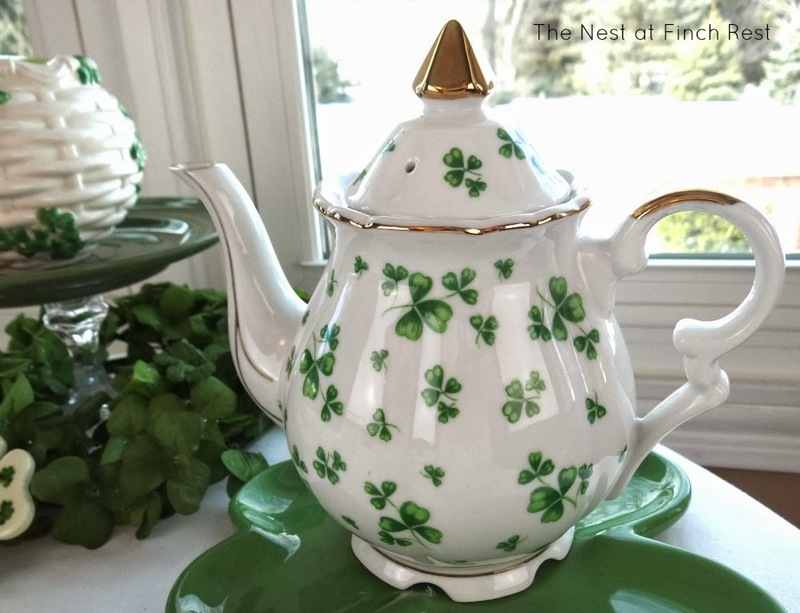 Last year, I found the most wonderful shamrock teapot from a terrific eBay seller (you may have heard of her? ), and to my amazement, she included in my package a gorgeous shamrock teacup! 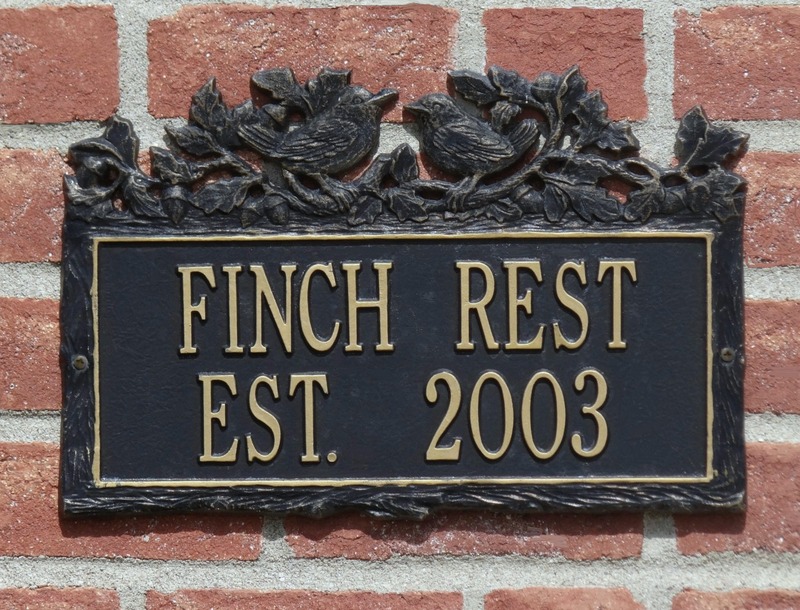 I'll be creating a vignette with it all in the next few days -- can't wait! It's such a pretty pattern Michele! A wee bit of Irish in you Michele? :-) What a fabulous collection, did you make the sugar cubes? I haven't decorated them since my baking classes but they're impressive on a tea table. I hope I find a pretty shamrock or two when I go to Ireland in June. You have some collection there! I love it all-it makes me smile. You are all set for St. Paddy's. The spoons are darling, the teapot fabo, the pitcher so pretty, the tea cups divine and all together, they make a table any Irishwoman would be proud to set. Have missed you Michele, your collection is georgeous! Love the teapot. Your shamrock china is so pretty, Michele. You have a lovely collection and might there be a wee bit of the Irish in you, my friend? The spoons are darling and I love the teapot! It's always fun to see your shamrock pretties and thanks for sharing them with us. Thanks for joining me for tea and enjoy your day. Beautiful!! You have a fabulous collection of shamrocks. March is my birth month so I've been collecting a few shamrocks, too. 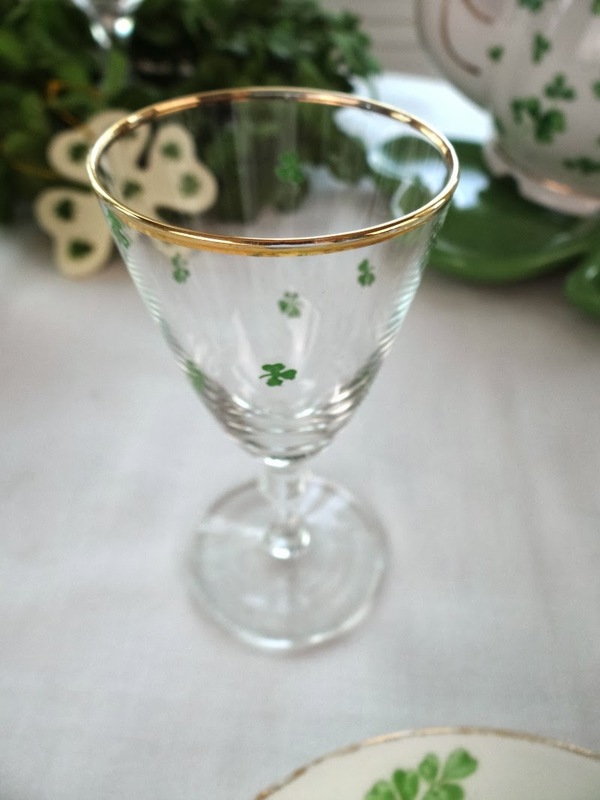 Your Shamrock china is so pretty and perfect for the upcoming special day on the 17th. :) I must look for something tomorrow as I don't have one thing with a shamrock on it. 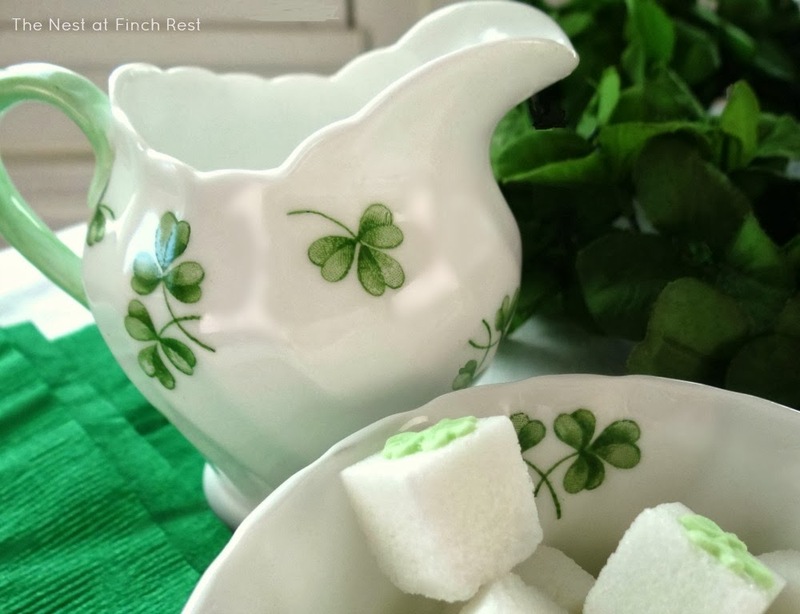 Those little shamrock sugar cubes are adorable too. Totally happy to find your shamrocks ! I posted TeaTime in Scotland this week - kettle's always on! You have the single prettiest collection of shamrock stuff that I've seen IRL or out in Blogville. I love it all. Michelle, this is just the cutest, freshest table! I love your collection. I read the other day that St Patrick was having a difficult time explaining the Trinity to one group in Ireland when The Lord prompted him to pick up a shamrock and explain it that way. 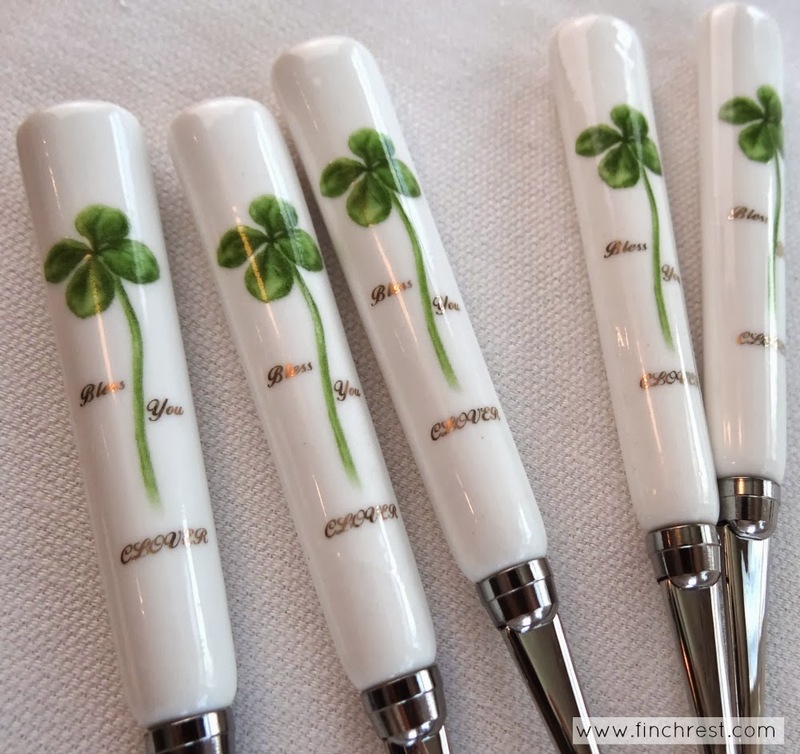 I loved reading that just as I love your shamrocks... And those spoons are too, too cute! 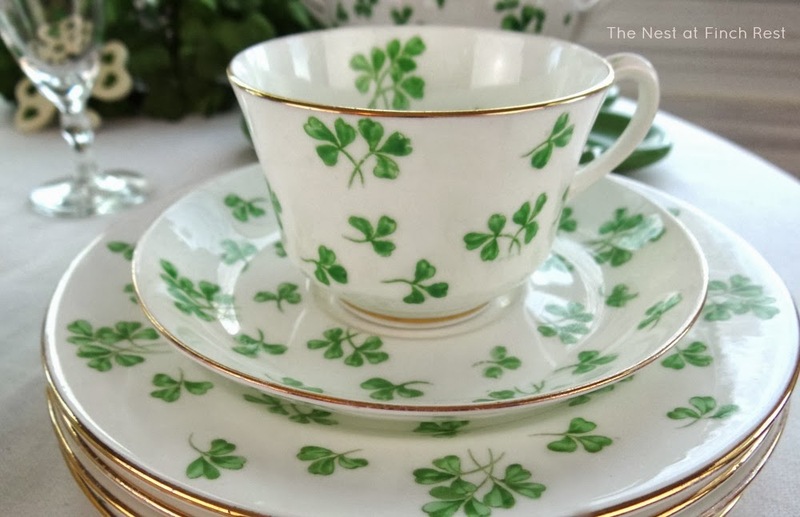 Ooh love the shamrock china! You have some real nice goodies there! Love, love, love your shamrock china!! You have some beautiful pieces. Those spoons are so cute!! All the way down to the sugar cubes! This post is sweet!! 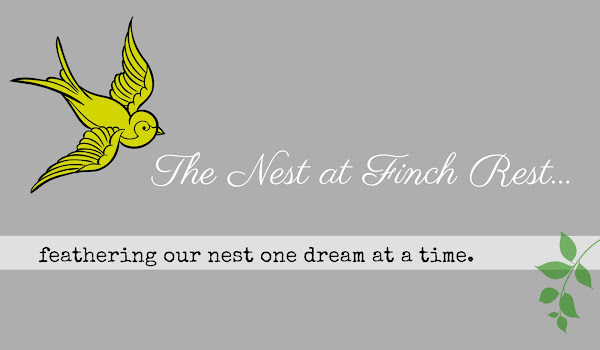 Hello, love finches, I watch every day for their return to Maine. Where do they go? I went to the Beellick factory and Waterford. First visit Happy St. Pats Day. Wow Michele, you have a very impressive collection of shamrock items. The teapot is my favorite. I don't have any shamrock china but you have inspired me to begin my own little collection. What a beautiful collection you have!!! Thank you so much for sharing. Michele your shamrock china is beautiful. I love the sugar cubes, so unique! I love your china! Love tea sets, yours is perfect for the season! Michele, your shamrock china is lovely. I need to keep my eyes open for some pieces. Such a lovely collection of china. Love it all. The sugar cubes are great! Lovely...that tea set is wonderful. Your china is gorgeous! And such fun for Kathleen's event. I hope you will photograph your event. I love your tea set. All your collectibles are darling. 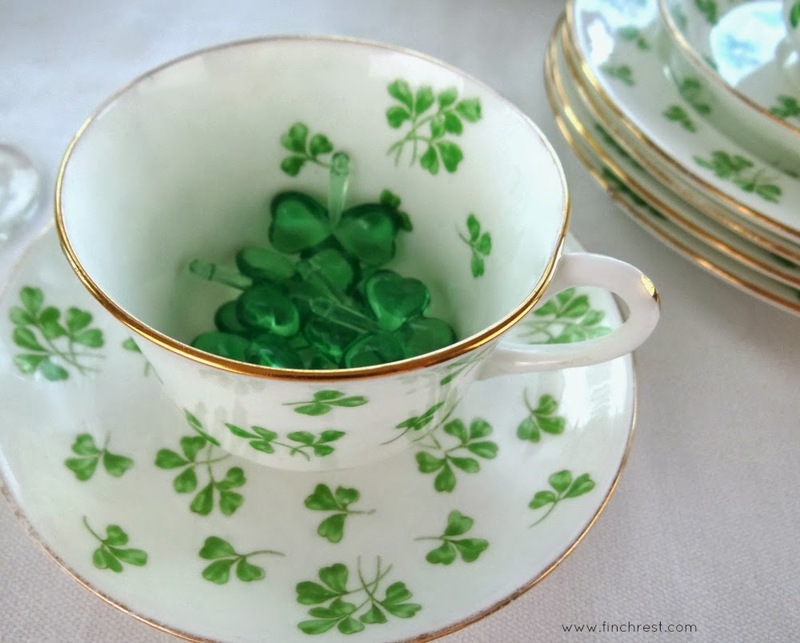 I like the jewel shamrocks in the tea cups in your first pic. I can tell you have enjoyed collecting for years. Green Shamrocks everywhere! Love the teaware and it is perfect for St. Paddy's Day! Your teapot is a beautiufl shape! Have a wonderful March 17th! Oh so pretty! This is really in the spirit of things. You have a wonderful collection of things right in my taste. I especially love the glasses. Those alone would make a table for me. Happy St. Pat's! 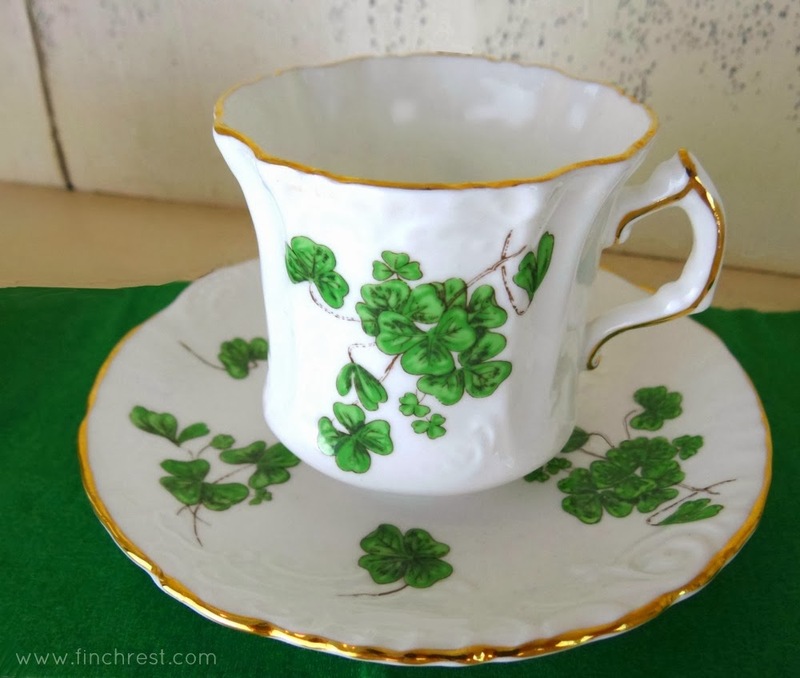 I love your shamrock china, I remember the first time you showed us! Shamrock envy! 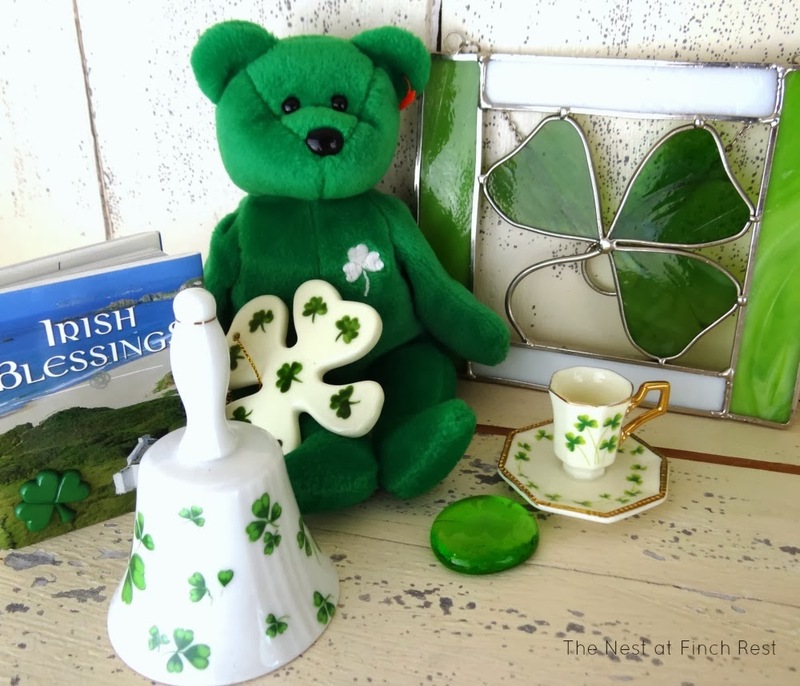 You have so many tea time things for Saint Patrick's Day - beautiful!